Weddings Costs > How Much Does a Wedding Officiant Cost? Nearly every state requires an officiant to legally recognize a wedding, and the term “officiant” refers to anyone who’s legally able to perform a wedding ceremony and sign a marriage license. This can range anywhere from a religious pastor to a professional celebrant who does it for a living. The costs will all depend on who you’re using, their experience, where you’re getting married, if premarital counseling is involved, if they are needed for a rehearsal, your geographical location and the time and effort spent on the wedding. On average a simple civil ceremony by a justice of the peace will cost about $50 to $125, and this will be done at a local city hall, park or a courthouse. An intern minister or a retired judge might be a pinch more, charging anywhere from as little as a donation to more than $250. A church minister/pastor or a professional celebrant might charge as much as $200 to $600, while an amateur might charge less than $100. It’s not uncommon to see some popular rabbis charge more than $800. WeddingOfficiants.com says the average officiant can range anywhere from free to as much as $1,000, but says the average is about $600. On WeddingBee.com, members paid anywhere from $400 for three meetings and the ceremony to as much as $750 for a custom ceremony in New York City. Most officiants will want to meet you before the wedding even begins to get to know you and your significant other better. Depending on their policy, you may meet with this professional two to three times before the wedding day and this is commonly referred to as premarital counseling. Aside from getting to know you, they may want to know about your feelings, marriage and family. During these meetings, you will also discuss the venue, the time, how you’re structuring the wedding and what you want from the official. A few days before the wedding, he or she will meet with you for a rehearsal and will get ready for your big day. This will be the time to practice the wedding and go over all the details to make sure everyone is on the same page. On the official wedding day, they will arrive early, signing the marriage license with witnesses and performing the ceremony. After the wedding completes, he or she will mail the marriage license to the county to be officially recorded. One will also be mailed to the couple as well. Some officiants may charge to show up during the rehearsal. If an officiant has to travel outside their driving radius, which is usually 20 to 30 miles or more, a mileage surcharge may apply. This could be about $0.30 to $0.60 per mile, depending on how far they need to drive. Premarital counseling can often be provided, and some officiants may include it in their quote or may charge it separately on a per session basis. It has been said that summer and spring months will be much more than the fall and winter. It’s also said that Friday and Saturdays will be more, but this can be said with any professional you hire for anything. Some officiants may charge per hour, and if the ceremony is longer than expected, you may have to pay overtime fees. 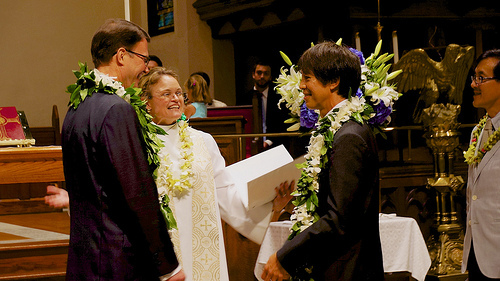 Usually, a tip is recommended after the ceremony has been performed. Any gratuity handed to a pastor or minister will be deposited into the church funds, while a professional officiant will collect the fee for themselves. Thank you gifts for a wedding officiant can be considered too. Start looking for an officiant as soon as you can, especially if you’re booking during the peak seasons. If possible, always choose someone who you feel close with. This can include a pastor at your church or a close friend who you trust. See if you can check out some of their past performances. Most officiants will have some footage from previous weddings they have performed. When paying, always ask what’s included in your fee as all officiants will have different inclusions. If the officiant doesn’t have to rush, consider inviting them to the rehearsal dinner and/or wedding reception as a kind gesture to show your gratitude. Consider having a friend or family member become an ordained minister as the process is simple and can be done for a few dollars. You can become ordained through the Universal Life Church, but before doing so, check the regulations in your state to see if the license will be legal. Only go this route if the celebrant isn’t that important to you. If you are a member of a local church, the pastor of your church will more than likely be willing to perform the ceremony and provide counseling free of charge. However, most couples still give their pastors generous donations for their time. The pastor at the First Lutheran Church is a great pastor to get a wedding performance done with little or no cost.